Preheat oven to 375 degrees. Prepare muffin tins by greasing with cooking spray or lining with paper cups. This recipe make 24 regular-size muffins or 12 jumbo muffins. In a small bowl, pour boiling water over the wheat bran. Stir with a fork so that all of the bran is moistened. Let set for 10 minutes. In a large bowl, whisk together the whole wheat flour, all-purpose flour, baking powder, baking soda, salt and cinnamon. In a separate large bowl, lightly beat the eggs. Add the honey, molasses, butter, milk and brown sugar and beat until well combined. Add the moistened wheat bran and stir to combine. Add the dry ingredients to the wet ingredients and gently fold them in with a rubber spatula. Fold in the raisins and walnuts. Cover bowl with plastic wrap and refrigerate batter for 1 hour. Fill prepared muffin cups 3/4 full. Sprinkle a couple Old Fashioned oats over the top of each muffin. Bake at 375 degrees for 15 to 18 minutes or until a toothpick inserted in the middle of a muffin comes out clean. Allow muffins to cool 5 minutes before serving. This muffin batter can be made ahead of time and refrigerated for 5 days. Since this recipe makes a lot of batter, I'll sometimes make one batch of muffins to start the week and then another batch for the weekend. 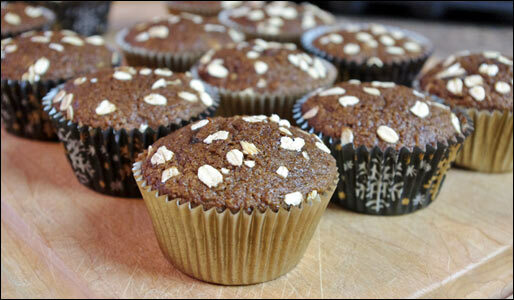 Fresh bran muffins all week long. You can't beat that. Good old fashioned (mostly) whole wheat bran muffins with raisins, walnuts and a touch of cinnamon, vanilla and orange zest. Dare I say, they're bran-tastic! Recipe number 3131. Submitted 8/19/2012.